As my second book to review, I have chosen….a magazine. Not even a magazine title as a publication in total, but a single edition of that magazine. The May/June 1997 edition of Photo Techniques magazine changed my life. In this edition, Mike Johnston introduced a concept to the western world that he and John Kennerdell, a colleague and contributor had been discussing for a while. It seems John made him aware that the Japanese had for many years categorised lenses with more than the usual measures of quality. They took careful note of the qualities of out of focus blur different lenses rendered and their effect on the images made. They even named the types of blur they discussed. John Kennerdell, who was living in Japan at the time, had noticed a habit of local reviewers referring to the out of focus (OoF) areas of an image with terms such as Ni-sen (cross-eyed), rather than simply ignoring them all together as reviewers in the west did. Many photographers all around the world used terms like the “draw” or rendering of a lens, but there was little clarity to that thinking other than on a lens by lens basis. The irony was, the Japanese had been making lenses for a sharpness hungry western consumer, while at home, they often preferred German glass for its less measurable characteristics. 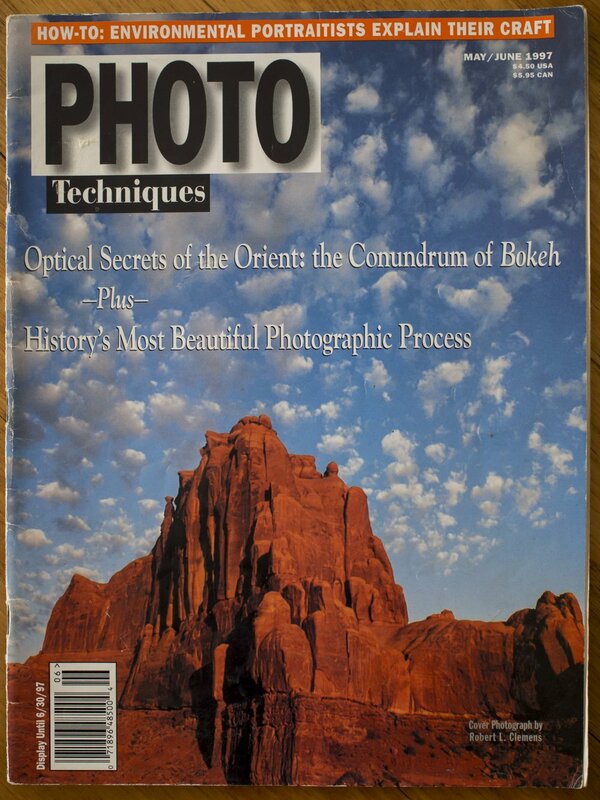 The editor of Photo Techniques, Mike Johnston, decided to make Bokeh* the theme of the May/June 1997 edition. It is important to realise, the term Bokeh and even the line of thought it created had never been used in western photography before this point. In hindsight, it was a brave move. The predicted result would have probably been a foot note in photographies “odds and sods” ledger, but on a scale no one expected, the concept took off to heights unprecedented. There is now seldom a lens review or conversation to be had about lens character or performance that does not have an element or reference to Bokeh in it. Many lenses now made with Bokeh (or at least one form of it) as their primary design objective. As the article explains, some companies were already trying to satisfy this deeper need of Japanese photographers, by incorporating Bokeh into their designs. Canon seems to have made “good” (smooth and controlled) Bokeh one of the parameters of their new EF lens range as two of the lenses specifically mentioned in the article were from their early “ugly duckling” range. Bronica is also mentioned specifically along side the German makers. Unassuming, classy and modest, this periodical was an automatic buy for me along with Camera and Darkroom, mostly for the articles about photographers current and retrospective or advanced technique as well as the dry wisdom of David Vestal. Pretty good condition considering. I still have a hoard of 50 or so mags from this era, as they are far too precious to me to toss. It is amazing how relevant they still are. Sorry about the rough and ready pics, but I am not going for archival quality, just the feeling of the actual mag. It took 28 pages before it got to the main article spread, but I was instantly hooked. It had the perfect combination (for me) of being relevant information, a reveal of mysterious secrets and eminently applicable technique. It did not hurt that at the time, I was using two of the lenses in the samples (100 f2.8 EF macro, the old one, and the first EF 35 f2) and it also referenced a brand I had just moved out of, but had great fondness for, Zenza Bronica. Even though I loved the article, I and I guess everyone else out there had little idea how important this would become. Mike followed this thread up in later years on the Luminous Landscape site and others, but this is ground zero. My instant reaction was “some lens very bad, some lens goood :)”, so even I, a fan, did not really get the intended meaning. All Bokeh has it’s place. More recently the 3D vs flat argument has surfaced, which I think is closely linked to Bokeh, so maybe we are entering phase two? One of the strongest lessons I learned from the article, one sadly forgotten in more recent times, is that Bokeh, in it’s many forms, is important in almost every photographic situation that has any amount of OoF area regardless of focal length, aperture selected or distance. There is no right or wrong, nor a fixed formula to achieve that mythical, ideal look. The point to take away, is that Bokeh, however you like it, may only be achievable under some conditions and these may change with any slight variation in lens use of the very same lens. The frame bottom right was from a “Bokeh king” semi wide angle used at a medium aperture and focussing distance, not wide open and up close as is so common these days. This kind of talk does not wash with many currently, but is at the essence of Bokeh and it’s true exponents. Oren Grad followed up with an overview of the terminology used at the time, which has now grown and changed into more westernised terms like “feathered”, “onion ring” or “solid”. Then the more technical article, that I must admit I have not properly read as I find this type of thing efficiently removes the joy from something as intuitive and emotional as Bokeh. Lots of this. Too dry for me, but technically sound stuff and the foundation of the future math and understanding. Ahead of it’s time really. There was lots of other good stuff in there as usual. 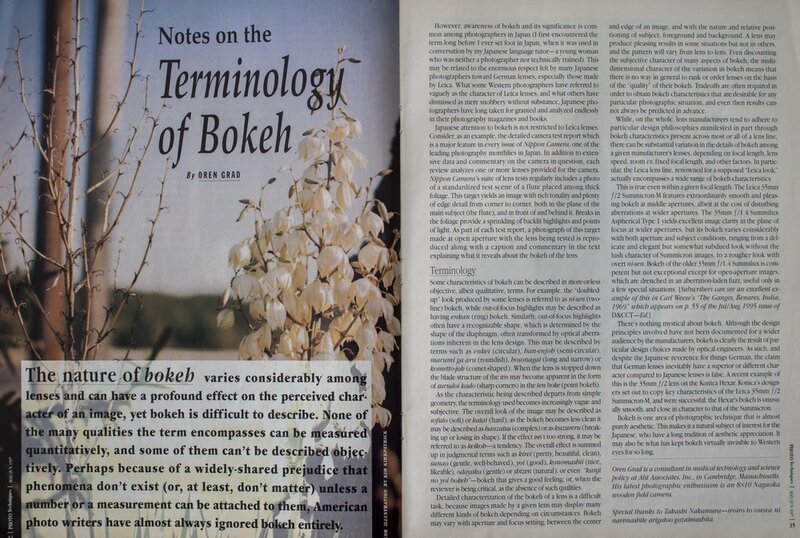 Inspiration abounds, but the Bokeh article cemented this edition into modern photographies history. It is kind of weird that no mention is made of OoF elements in any of the articles, except the ones that only talk about it. This was about to change. And the final word by Mike. Of note is his description of using the EF 35 f2 lens. I must admit to being ignorant of the influence Mike Johnston had in the photographic world at this time, but after this article, I became very aware of him. He was a strong voice in the Camera and Darkroom, Darkroom and Photographic Techniques > Photo Techniques and many other books and periodicals. The very first blog I went looking for when I went “online”, was anything connected to Mike, which turned out to be The Online Photographer. Here you can find a lot more by both he and John Kennerdell, including the article called “in defence of depth” or the anti Bokeh as super shallow DoF only, rallying cry and “A little lens tale” that highlights both long draw Bokeh lenses and lenses that put natural three dimensionality ahead of sterile fault correction (coming to much the same conclusions as Yannick Khong but this time without defined terminology). Their can, their worms, their cross to bare I guess, but I am glad I was in on the ground floor.